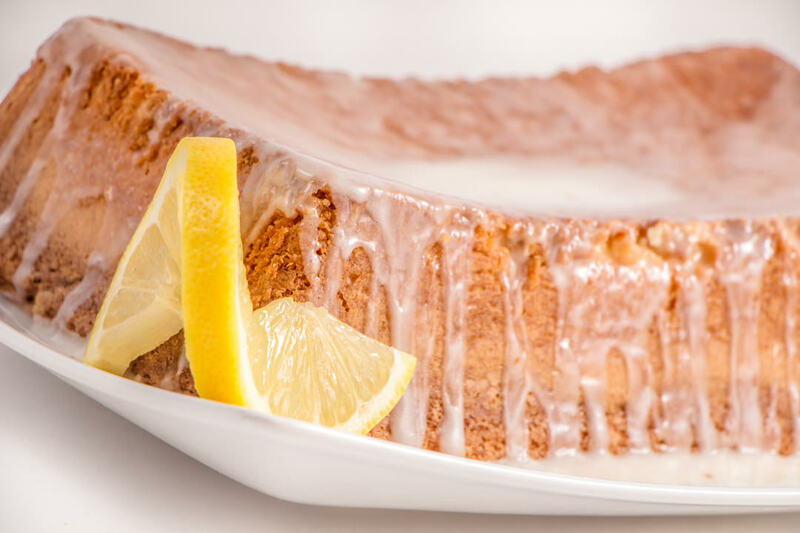 Years ago I came across this recipe and through the years have adapted it to my liking, but regardless the Lemon Cream Cheese Pound Cake is among my absolute favorite pound cake recipes. It’s rich and dense and full of flavor. 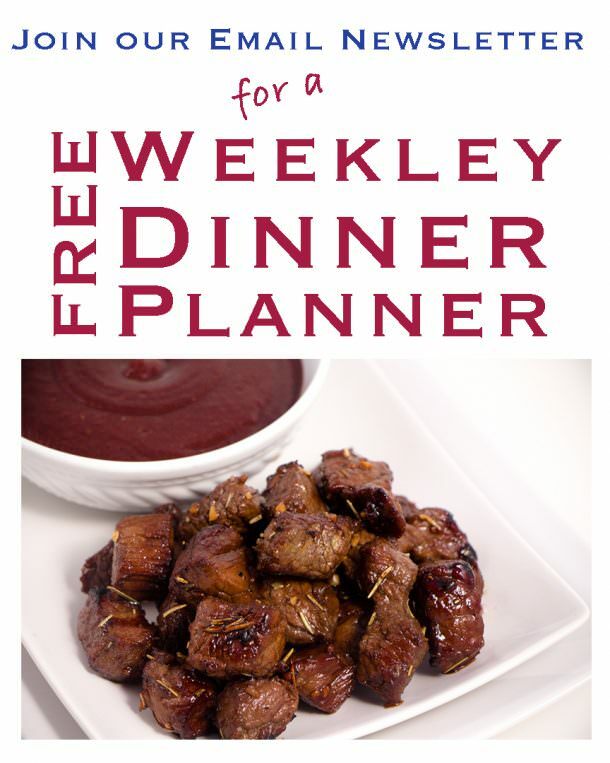 It’s so versatile it can be used in so many other dishes which I love. I’ve also been known to add fresh raspberries to the batter just before baking because who wouldn’t want a bit of Raspberry Lemon Cream Cheese Pound Cake? To start, make the original version. You will be instantly hooked and if by chance there is any left, put it in the fridge because there is something about this recipe after it sits in the fridge over night that is magical. Don’t believe it, Just try it! As you can see by the video, I have a Bosch mixer. I love my Bosch. It’s heavy duty and will take care of my mixing needs. For this recipe you don’t need a heavy duty mixer, but it sure comes in handy if you have one. I like to whip my butter and sugar until light and fluffy. It just helps this cake when baking I feel. Then add the cream cheese and then it whip some more. It looks so rich. Adding the eggs one at a time is important. The eggs will change the consistency very quickly, so add them one at a time and incorporate them into the mixture before adding more. It really does help in the mixing process. Then finish adding your vanilla, salt, lemon juice and zest. Finally add your flour. If you are using a hand mixer it would be best to add the flour a little at a time. I’ve been spoiled by my Bosch mixer that can handle it all at once. 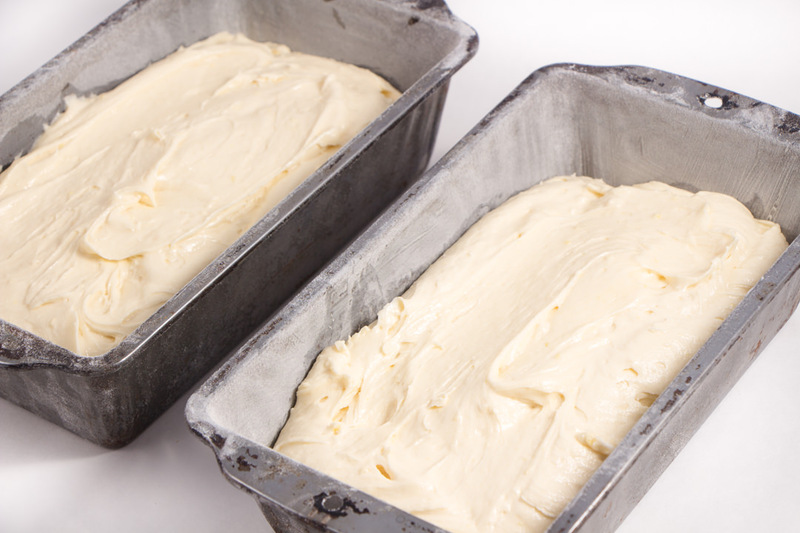 Lemon Cream Cheese Pound Cake is a heavy rich cake, so it’s important that you grease and flour the bread pans or the batter will stick and your bread will not come out clean. Take my word on this one, I’ve lost many loaves by just using a spray. haha..Sure you can scrape it out neatly, but it’s not the same. Especially when you want to take some to your neighbors. This recipe can be tricky. I always want to take it out too soon. So keep in mind the top will get a rich golden color and almost look over cooked before the center will be cooked through. Use a toothpick and check the center at the hour mark. Notice that you are baking this recipe at 325, so the heat is a little lower than you might expect. Where each oven is different, it could take as long as an hour and 15 minutes. Mine typically takes about 1 hour and 5 minutes. 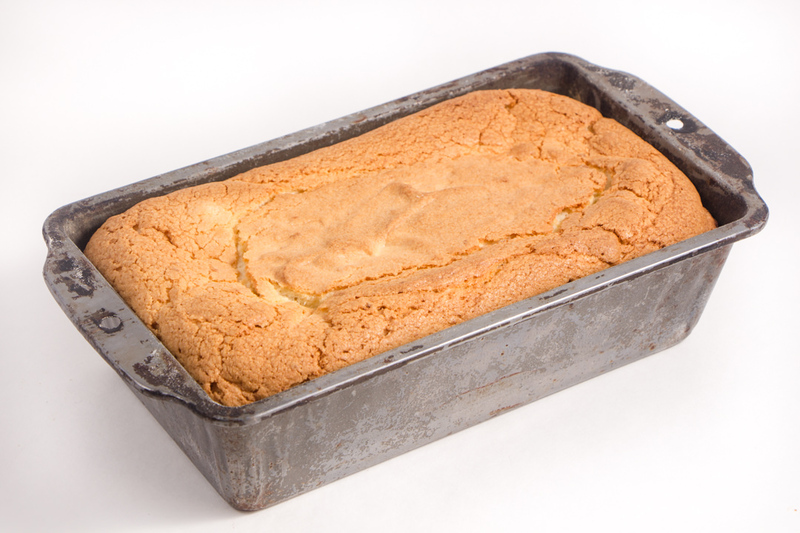 Once I take this pound cake out of the oven, I let it sit for a few minutes before I flip it out of the pan. You can serve this top up or down, it does not matter. I like the square flatness of the bottom for the top as seen in the video. But either way, there is no wrong answer here folks! 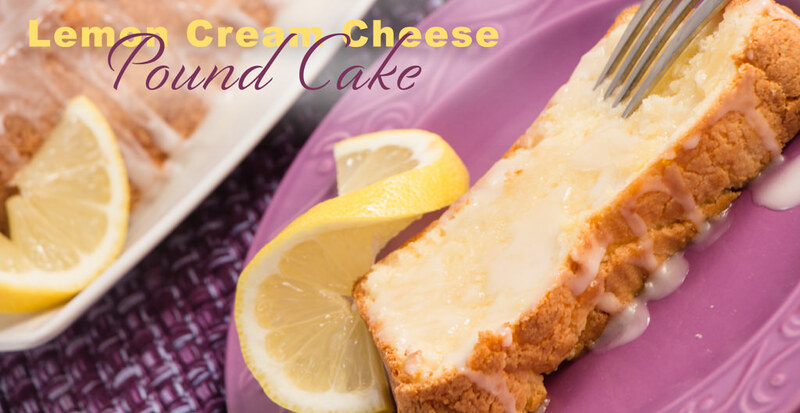 Lemon Cream Cheese Pound Cake is a dense heavy lemon cake that is rich and full of flavor. Perfect alone, or with strawberry shortcake. It's delicious. Add Eggs, One at a time and allow to be fully mixed in. Add Lemon juice, vanilla, and salt. Grease and flour 2 bread pans and divide batter equally into pans. Bake for 1 hour to 1 hour 15 minutes. Use a toothpick in the center to test for doneness. Bread will be done with toothpick comes out clean from center. 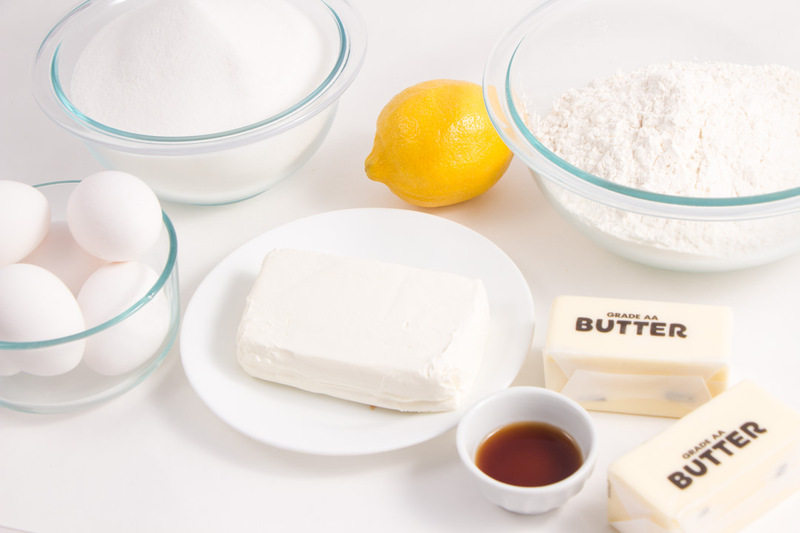 Mix butter and powered sugar in a mixing bowl. Add Lemon Juice. This will be thin. If you prefer a thicker glaze, add more powdered sugar. Drizzle over top of warm bread and allow to run down sides. 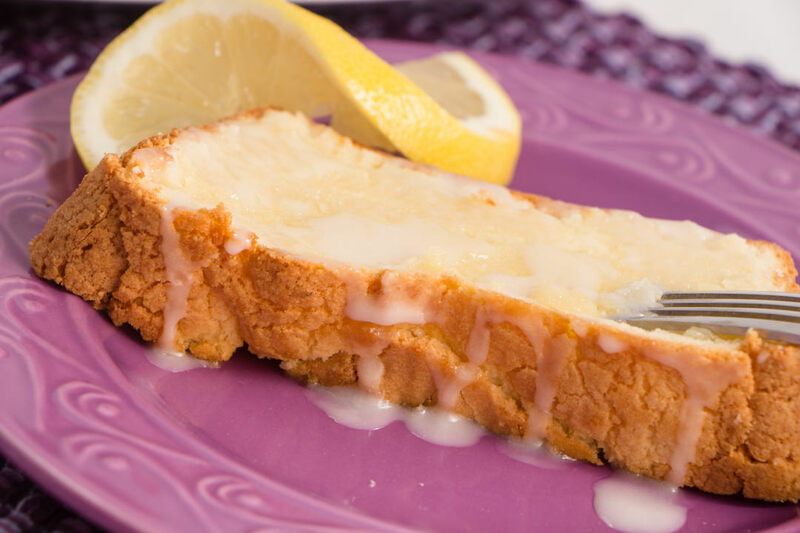 I love pound cake and I love lemon cake – put them together and bam!!! I can not wait to try this recipe!!! This is utter and complete perfection!!!! OMG! I can’t wait to pin! This sounds delicious and your bright colors have me ready for spring! I can imagine it’s a very great combination with the lemon and cheese! 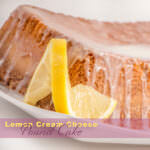 Love almost all forms of lemon cakes! This looks so delicious! Can’t wait to make it soon! Oh, I’m so drooling right now. This looks absolutely delicious!! This has got to be one of my all time favorite sweet treats! Adding all the ingredients to my grocery list so I can make this for the holiday weekend. Pound cake is one of my absolute favorite desserts. I love how you really broke down the steps. This looks so yummy and I love cheesecake. But I’ve never had lemon cheesecake. I love your recipes! This looks so amazing! Lemon cake is one of my weaknesses. I can’t wait to try this one! Wow this looks super good!!! Illl have to try it!! Yum!! This looks and sounds so good. Pinning it to try sometime. I think pound cakes are so versatile to have in the freezer too. I do love a nice lemon cake. I’m definitely going to give this a try.